The 5,500gn gimmer from Birness. Scottish breeders were out in force at the Dark Diamonds Suffolk sale in Carlisle. Leading the sale at 7,000gn was a gimmer from Irish breeder Andrew Wilson’s Castleisle flock. By the 2016 sire of the year Birness Murray, she sold in-lamb to twins by the 40,000gn Limestone Aston Martin to Messrs Cobbald, Acton, Sudbury. Next best at 5,500gn was a gimmer from George and Melvin Stuart who run the Birness flock at Milltown of Birness, Ellon. Their sale leader was by the 10,000gn Redbrae Rambo, scanned in-lamb with twins to the 9,500gn Limestone Legacy. She sold to Messrs Paterson, Huntly. Birness also sold to 2,400gn for another gimmer by Redbrae Rambo, also in-lamb with twins by Limeston Legacy. She sold to Messrs Skidmore, Billingham, Cleveland. Other leading prices included 2,800gn for a gimmer from Fife breeder Stewart Craft’s Lakeview flock at Little Balquhormie, Leslie. By Burnview Whirlwind, and in-lamb to a single by the 22,000gn Strathbogie Stradivarius, she sold to Messrs Priestley, Downpatrick, Northern Ireland. Meanwhile, Graeme Christie sold to a top of 2,000gn for a gimmer from his Balquhain flock at Newton of Balquhain, Inverurie.Selling to Messrs Miskelly, Alford, was a daughter of the 5,500gn Limestone Rolo, scanned in-lamb to twins by the 6,000gn Lakeview Under the Radar. Veteran breeder Jimmy Douglas, who runs the Cairness flock at Woodhead of Cairness, Fraserburgh, sold to a top of 1,500gn. 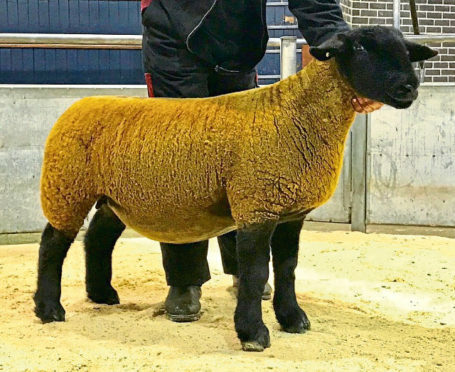 His sale topper, selling to the Moir family at Home Farm, Cairness, Fraserburgh, was a gimmer by the 31,000 euro Cloontagh Chieftain, in-lamb with twins by the 15,000gn Cairness Sir William. Lastly, fellow Fraserburgh breeder John Gibb, who runs the Cairnton flock at Techmuiry, sold to a top of 1,000gn for a Cairnton Sir William daughter, in-lamb to the 5,200gn Rhaedr High Roller. She sold to Messrs Henderson, Peterhead.